Above: Searching for friction on the vertical playground. All photos by Marko Prezelj. All stories have to start somewhere. This one started over a cold beer when Marko Prezelj, Tadej Krišelj and I were sitting on the porch of Marko´s house on a warm, early summer evening discussing future plans. 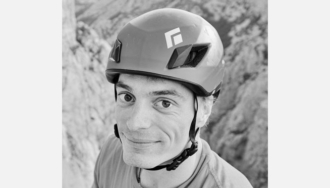 The debate evolved and ideas flew by when Marko briefly mentioned that together with Klemen Mali, more than ten years ago, he tried to climb a new route on the northwest face of Vežica in the Kamnik–Savinja Alps. The wall lies in the northern part of Slovenia and is known for its steep nature and quality limestone. 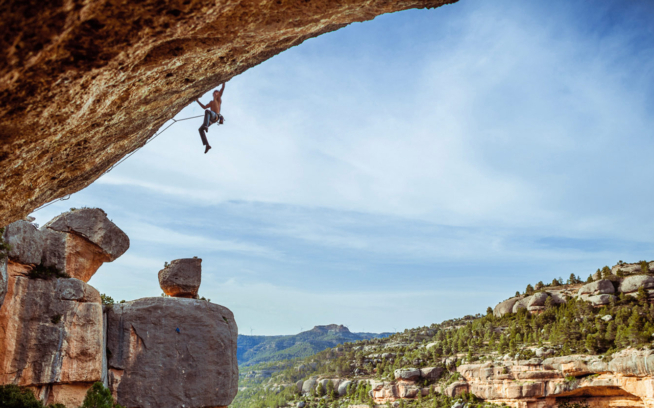 After climbing one long pitch and scoping the central part of the wall they realized that their fitness did not meet the requirements needed for climbing the route in the imagined style, so they put the project aside for a time when they might be stronger. 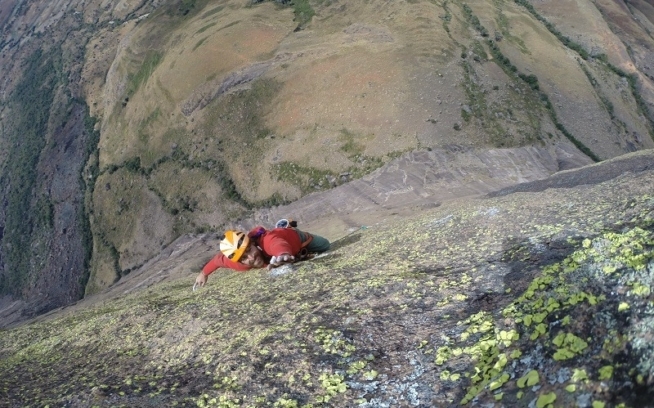 After several years they decided to pass the idea on to younger adventure-seeking climbers. Every seed needs to be planted before it can grow and develop into something bigger. This one immediately fell onto fertile ground as we were highly motivated and eager to face the challenge. A few days later, we found ourselves on the steep approach in a joyful atmosphere full of excitement and expectation. Marko showed us the proposed line, we discussed various technical and ethical strategies and then he left us for our reality check. Climbers choose the rules by which we want to play the game. When making first ascents, this fact is even more evident and essential. Our plan was to climb the route with minimum use of fixed gear in a style that would help us discover (the proximity of) our physical and psychological limits. We accepted the challenge by free climbing ground up, using technical help only for placing protection and never for advancing. We knew, that by following this recipe, a highly memorable experience would be guaranteed. What started as a short-term objective, evolved into a project that took us more than 15 different days over two seasons to complete—most of them found us stepping far out of the comfort zone in search of our inner borders. The steep and sloping nature of the rock proved difficult for placing protection. We encountered many intense moments and multiple long falls, after which our balls shrunk to the size of peanuts and our hearts raced as if we were at the Olympics. There were times when progress seemed elusive and accompanied with fatigue; the thoughts of failure started crawling into our minds. In moments like that we felt tempted to adjust the strict rules of the game that we had set and equip the route from the top. Luckily, we soon came to our senses and didn’t react to the temptations that we would regret right away. We realized that what we really enjoy is the whole process. So we didn’t give up and, countless falls later, spread over two and a half days of effort, we finally succeeded in passing the most difficult second pitch. The remaining terrain ahead proved to be physically easier but required the same serious and focused approach. On many of the visits, our stubbornness clashed with the weather and brought us to situations where we had to descend back to the valley soaked to the bone in the middle of a rainstorm. But all of that was part of the experience and we realized that none of the days we spent up there were wasted. Despite the majority of the obvious features being climbed, there are plenty of challenges left for those looking from the right perspective. An international mix of motivated personalities with the same passion and lots of positive spirit. This summer our alpine team hosted a group of French climbers to introduce them to our climbing environment and share the spirit. At the start, the weather was not in our favor but motivation was high and nothing kept us away from climbing at some steep rain-proof crags. Our energy potentiated as everyone tried to push our own and each other’s limits. The days went by and the weather finally improved so it was time to head for the mountains. All of our guests already had their partners and plans for the following day, so together with Tadej we decided to give our project one more try. At the same time, I promised a strong French lady, Aurelie Didillon, that we would climb another interesting route together in my home mountains the day after. She decided to take a rest day for that reason, and Tadej and I got an early start to make the most out of the day and return before the evening. Martin and Renaud also joined us to climb a different route on the same wall, so the drive and approach were full of laughter and passed quickly. The closer to the wall we came, the less I laughed as my head knew what was approaching. All of a sudden I started feeling the pressure of the job ahead and it was obvious everything would have to come together perfectly to make our goal a reality. After the initial routine, I slowly started to move up the crux pitch feeling the inner tension while unsuccessfully trying to convince myself it’s not a big deal. Fueled by the positive energy that was present during the whole week, my body stayed in correlation with my mind and I managed to free climb the pitch on my first try of the day. For a few moments I couldn’t believe what just happened, but later the hormones of happiness kicked in and a big smile grew on my face. Tadej also gave it a few good tries but success unfortunately eluded him for the day. By that time it was already late in the afternoon and we had several pitches of serious climbing to go, so I called Marko and asked if he could find Aurelie a substitute for me, as it was clear we wouldn’t be back soon enough to head to the mountains the next day. It became dark three pitches before the summit and we had to try really hard to fight the cramps in our muscles and minds to safely follow the glow of our head lamps to the top. Happy faces at the end of a great journey. At the end of the day my mind was full of mixed emotions. I was thrilled to finally succeed in free climbing the route that took so much effort out of us, but on the other hand I felt sorry for Tadej and kind of guilty that I didn´t keep the promise I made to Aurelie the day before. We arrived back to the valley in the middle of the night and were too tired to drive safely, so my girlfriend Ajda helped us out and drove us back to our starting point where we arrived 25 hours after our departure. Luckily, Aurelie found another partner and headed out an hour after we returned. A deserved rest day followed and in the evening we all celebrated a week full of laughter and great moments, while a mix of French and Slovenian beverages helped to give the final evening an even more relaxed international feel. It’s in our nature to always seek bigger goals and more difficult challenges. If we are lucky and look close enough, we can find them almost at our doorstep. We found what we were searching for and really came close to the limit of our current capabilities. We decided to name the route Štafeta which translates into “Relay” and symbolizes the evolution of an idea, from the first thoughts and attempt by Marko and Klemen more than ten years ago, to the finishing experience that Tadej and I had while climbing, talking or just dreaming about the route. We are thankful to our forerunners for the handoff of the idea that enabled us to have this memorable experience. To enrich it, Marko joined us again at the end to take some photos. After returning to the valley, we were sitting on our backpacks, discussing the simplicity of life and sipping on a can of chilled beer. The circle has obviously been concluded and now we are passing the adventure torch forward. Spending a rest day surrounded by the beauty of Soča river gorge. French impressions after a week of exploring the hidden corners of Slovenia. A true master of vertical ground demonstrates the relativity of climbing difficulty on our crux pitch. 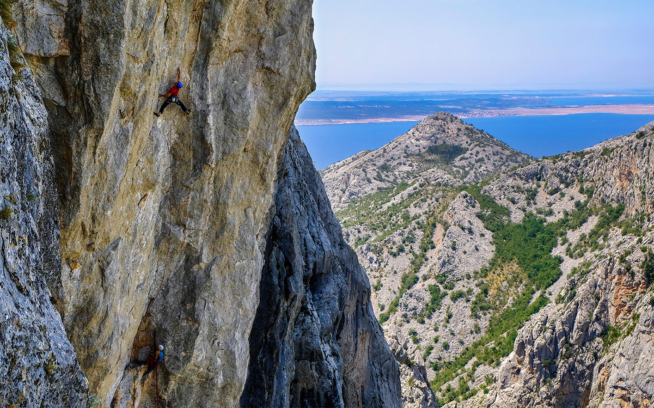 From technical perspective, the route is 400 meters long and apart from 12 bolts, of which 10 are used to protect the climbing and two for a belay, it is mostly protected by traditional gear. It offers a diverse collection of moves from overhangs to compact technical slabs with a common coefficient of serious character and limited protection. We estimate the difficulties of the crux pitch to be somewhere in the 8a+ (5.13c) range and several others require up to 7b+ (5.12c) fitness combined with a calm head. Seemingly lost in the greatness of the wall. Feeling thankful for sharing good energy and motivation together with Marko (left) and Tadej (right) from the initial idea to the finishing epilogue.